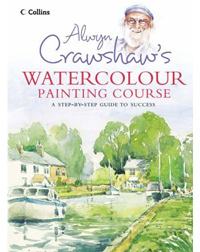 Alwyn Crawshaw has written 18 books on painting and is known and loved for his TV series for amateur painters. Crawshawe's Water Colour Painting Course has sold more than 100,000 copies worldwide and covers everything you want to know to get you started in watercolors. More comprehensive than his book for beginners (next in this category), the learner's guide covers 32 lessons and a wider variety of subjects. Watercolor is a very popular form of painting, often done outdoors and in the moment. Crawshaw prepares the student with what they need to know for painting outdoors. and provides instructions on how to paint common subjects of interest to be found there. The guide also covers common mistakes and how to avoid them. The demonstrations are clear and detailed without being cluttered or over-wordy. The reader will be set up with a good set of techniques to practice, and as the lessons get more advanced towards the end he or she will feel encouraged by the improvement made. Crawshaw gives a good overview of the equipment to buy, which if chosen wrongly can be very expensive. It is worth reading this chapter through before investing in any equipment. The teaching method is effective and builds stages gradually to give you confidence as you go along. This is an effective teaching method praised by his students and readers, but a handful of readers are of the opinion that the book does not contain hugely inspiring examples of paintings, which is quite important to get you started and maintain momentum throughout the course. Nevertheless, readers like his experienced style which is reassuring, easy to follow and effective. Any study needs the student to read around the subject and however good the book, there will always be more of a learning experience to be gained through the perspective of different teachers and authors. This is the drawback but possibly also the advantage of learning from a book. There is the danger with a video course to become dependent on the materials provided because they claim to provide you with all the answers, packaged as a "complete learning experience." Also, they can teach students to all paint in the same style by way of overly distinctive teaching methods. Crawshaw's watercolor course gives a good grounding for further study into the subject of painting that is potentially limitless. If through trying this book you like his relaxed teaching method, you might want to check out his other books on landscape, painting outdoors, using oils and "30-minute sketching" guide. The Watercolor Course is no longer in print but new or used copies may be obtained through Amazon.com or Amazon.co.uk. This makes it good value for money and an ideal first purchase to get you started in watercolor painting.